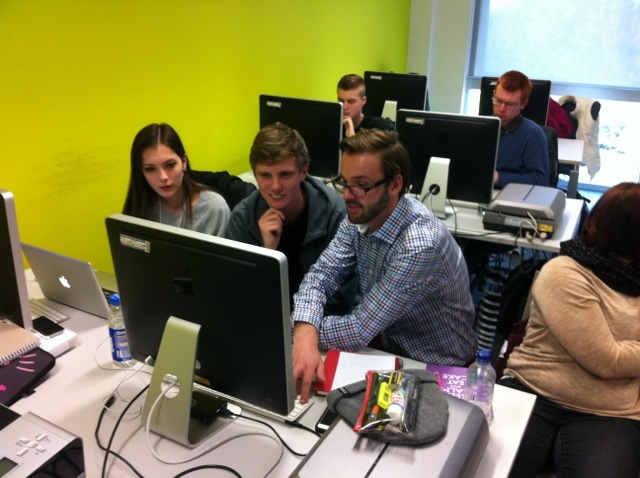 Marc Foley of type foundry Dalton Maag lending a helping hand to some of our BA students. arely, if ever, can education mirror precisely what is happening in industry. Consequently, there is an ongoing challenge to identify workable solutions to help bridge the gulf between the two. One such way is by asking guest speakers from industry to come in and talk to and work with the students and staff, and yesterday we were very fortunate to be visited by former WKC design student, Marc Foley, who now works for international font foundry Dalton Maag. During his studies Marc became fascinated by typeface design, and, largely by teaching himself the numerous intricacies of this field, he began working with Linotype whilst still a student at Reading, before more recently taking up his current position as a font engineer with Dalton Maag. The overarching theme for Marc’s talk was ‘What I wish I had known when I was a student’. The talk was a fascinating and amusing insight into Marc’s journey from student to professional, and consisted of personal reflections upon study and professional observations on what the real work-a-day realities of a design professional are, including some of the dos and dont’s of job hunting. Opening by outlining some of the possible roles that a design graduate might seek, Marc went on to stress some of the fundamentals of design that a graduate designer must be familiar with. It wouldn’t be right of me to repeat all of Marc’s lecture here, but I wanted to share just some of his key remarks simply because they are so valid and so commonly forgotten or neglected by students. Marc made many salient points and he weaved them together better than I’ve thrown them out here. Learn to set one paragraph of text correctly. Essential for the coherent structure of information is the use of a divisible grid. Learn how to set up a document properly. Calculate how to get well proportioned pages, types sizes and margins. I was particularly glad to hear Marc reinforce the value of these points, simply because having taught this and many other essential typographic conventions, I often sense that some students can be a little dismissive of what might be perceived as the dry and old fashioned stuff, when what they really want to do is to get back to making pretty pictures in Photoshop. Marc showed the students a range of designs that were fashionable in the 80s and 90s. 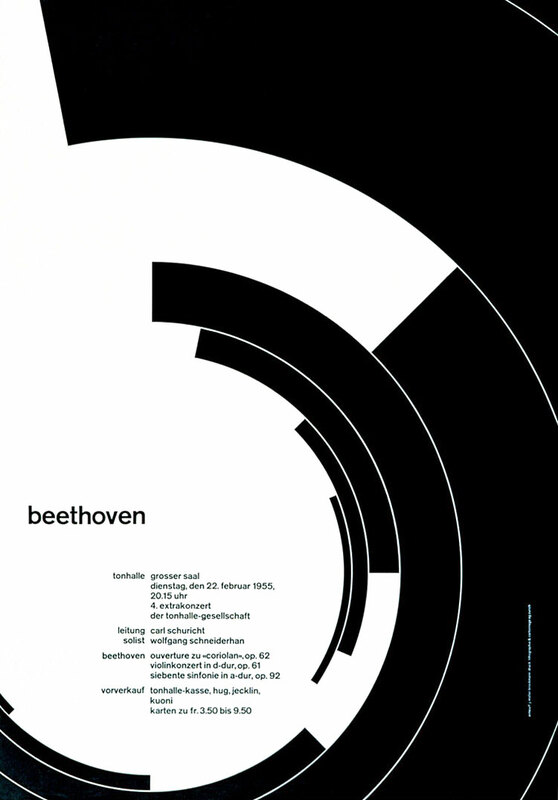 He then showed a piece of work by Josef Müller-Brockmann and asked the group if they could guess in what year it had been designed. No one in the group gave a date an earlier than 2000 and they were surprised to hear it was designed in 1955—without a Mac! Typos. We all make them, but in formal communications they indicate a lack of attention to detail. No matter how often I stress the importance of checking for errors, I am still amazed at how many communications I receive that use a lowercase ‘i’ for the personal pronoun or that are simply full of spelling mistakes, or portfolios brought to college interviews with work riddled with typos. It’s this sort of error that will end with your CV going into the bin and the chance of an interview being wasted. Marc recommended that students should have a book on grammar usage to refer to. Make your final project count. Be yourself. Wear a smile. Having a good manner goes a long way. Have other hobbies outside of design.